Double Tanks are considered two tanks and will use two air fill credits. Pony Tanks* filled at the time of a regular tank fill, will be free of charge. Pony Tanks needing to be filled without a regular tank fill will be one air fill credit. 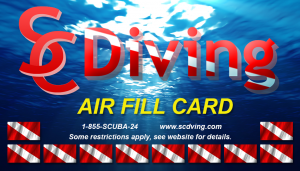 Valid Scuba Diver Certification Card required for all tank fills. Tanks must have current yearly visual inspection sticker and must have a current hydro static testing stamp. SCDiving reserves the right to refuse to fill any tank at any time. We will not fill any tank that has been listed by PSI or government agencies to no longer fill. Tanks that have little to no pressure will require a visual inspection prior to being filled by SCDiving. Tanks with less than 75 PSI will require a visual inspection. Hot fills or rush fills will result in loss of pressure when tank cools down. It is recommended to leave your tank after being filled and topping it off when you pick it up. Otherwise you may have a 300 to 700 PSI drop. 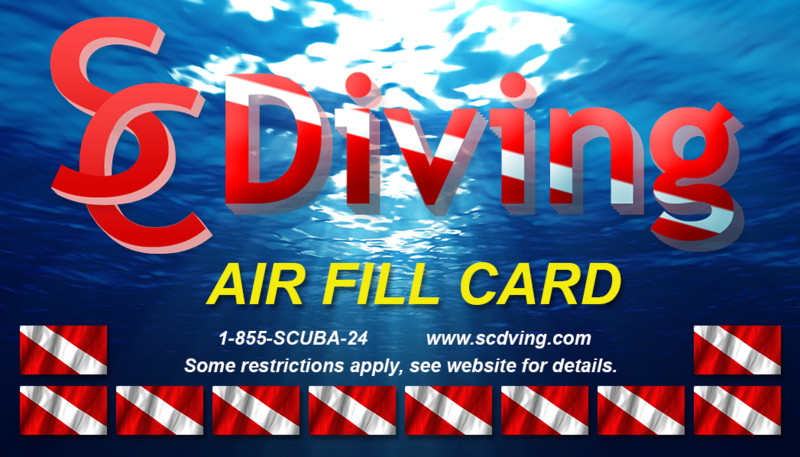 SCDiving Air Fill Cards and Credits are only available for use at SCDiving Dive Shop. You can rent a scuba tank using two air fill credits per day. Air Fill Cards and/or Credits do not hold any cash value, they do not expire and are non-transferable. No refunds on unused air fill credits or cards. You can purchase Air Fill Card or Credits at any time at our online store. Credits are automatically updated in your account after you checkout, usually within 30 minutes. You can view your credits and use history online when logging in on SCDiving.com. *Pony Tanks (aka Pony Bottles) up to 19 cubic feet. Larger Pony Bottles will require the use of 1 fill credit.